When I checked into a hotel in California, I was starving, so I ate the $6 box of Oreos from the minibar. Later that day, I walked down the street to a convenience store, bought an identical box for $2.50 and replenished the minibar before the hotel had a chance to restock it. Was this proper? My view is “no harm, no foul.” In fact, my box was fresher: the Oreos I ate were going to expire three months before the box I replaced them with. The hotel is providing not just a product but also a service — the convenience of having Oreos available in your room, 24/7. To create this utopia of constant confectionery access, the hotel had to pay someone to travel the world and select the finest vintage cookies, order the Oreos and stock the minibar. You enjoyed that service; you must pay the (ridiculously high) price. To replace the cookies, the person had to walk down the street to the store, read the label to check out the expiration date, etc, just as the hotel had to search the world for the finest cookies available and put a ridiculous price-sticker on them. So cookies for cookies. Fair trade. The person owes no money to the hotel. I have a lot of sympathy for the Oreo-eater. But he isn't quite right to say that there was no harm done, and Randy (in the excerpt) seems to have missed the relevant counterfactual. The comparison is not with a situation where no Oreo is consumed - it is with a situation where the guest succumbs to hunger, eats the Oreo and the hotel is $4 the richer (assuming that it costs them $2 to restock the cookie). So the hotel has been 'harmed' in the sense that it could have/should have had $4 extra in its account. Let's say that are two food stores in my town: a discount one which sells a jar of X at one dollar and an expensive one which sells a jar of X at two dollars. I have just bought at jar at the discount store for one dollar and I have it in my pocket. I enter the expensive store and by accident, I knock a jar of X off the shelf, breaking it. I quickly replace it with the jar I have in my pocket and put the broken jar in my pocket, thus not leaving clean-up work for anyone. Both jars have the same expiration date. I don't see why I haven't done anything wrong. Excuse me: that should read: "I don't see why I've done anything wrong." one disanalogy is the nature of the contract between the shop and shopper, and the hotel guest/hotel. Implicit on entering a shop a shopper is bound to either replace any accidentally broken goods, or to pay the shop price. Implicit on staying in a hotel room a hotel guest is bound to pay for anything that they consume (replacement isn't part of the deal). A closer analogy to the hotal room would be if, say, the shopper wandered down the aisle of the expensive shop and consumed a chocolate bar from their shelf - only to then replace it with one from his pocket. In that case my intuition is that there is something more dodgy about the shopper's actions. Dominic: When you say that replacement isn't part of the deal in the hotel, I agree, but I don't think that the deal is necessarily fair or just. Replacing the cookies seems fair to me, although it isn't, as you say, part of the deal. The rules in our society are generally designed to favor big business over the individual consumer, and so we (in my opinion) cannot assume that they are just. And many times, one has no choice except to enter into deals which are manifestly unjust, for example, in renting a room in an overpriced hotel (which is the only one in town). Hmm, I would do what the Oreo eater did, but I think I'd view it as a minor indiscretion. Sadly, I have to admit that Randy is right that what you've got to pay for is the convenience of having immediate access to oreos. Just replacing the oreos doesn't compensate the hotel for the service they are providing. Of course, they are charging an exorbitant fee for the convenience. They're also manipulating you by having the goodies on the premises, instead of offering room service. So you could try to justify just replacing the oreos by reference to all of that. But what next... stealing the towels? That doesn't seem like the right road to go down. The towels are the slippery slope fallacy. I could just as well say: what's next, leaving without paying the hotel bill? I think that replacing the cookies does compensate the hotel for the service. After all, the hotel bought or could have bought the cookies from exactly the same wholesale dealer as did the other store: that is, the markup on the hotel price is pure profit. Yes, the cookies are in the room, but is it really so much more expensive for a hotel to place a box of cookies in each room than for a retail store to make sure that there is always a box of cookies on its shelves? 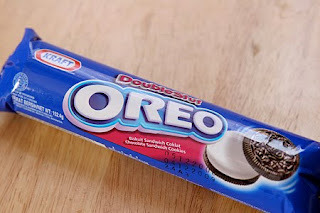 By the way, I think that it is significant that we are talking about oreo cookies, a product so common and so standard that even I, who live in Chile, am familiar with them. We are not talking about some special recipe or service that the hotel creates for its clients. Gas stations do it. Its the only gas station miles around, and charge an extra price for their gas. The location of goods and services directly affects the cost of them. Buying Oreos on the beach in Maui should cost more than buying Oreos in Nebraska at a grocery store. Essentially we're letting the market decide the price of those Oreos. But here's a problematic twist. Say a hurricane comes barreling through your town. Then the local gas station starts charging $20 a gallon. Not because there is a short supply of gasoline, but because people will pay it because of the circumstances. Or a contractor comes to town because of the hurricane and charges 150% more than his normal rate, because of the storm. Is this just as equally okay as the oreo? Amos, How can replacing the Oreos "compensate the hotel for the service"? You gave them back their cookies, but nothing with which to pay the Oreo Guy who runs around the hotel checking the stash and replacing things. Also, is it not their right to profit? Surely the price you pay for the room is some large % profit...but you can't choose to deduct that part from your bill. Wayne, I like the "location" analysis but Oreos are surely not a necessity, so you can't really call this price gouging. You can always just not eat them, but people need to buy gas. It would be a different matter if you had brought along that very same box of Oreos when you checked in — do you travel with a suitcase full of sweets? — and eaten them without unlocking the minibar. Although the final disposition of cookies would have been similar — a boxful in the minibar, a boxful in your belly — you would not have availed yourself of a hotel service, so you wouldn’t have had to pay for it. OK. First of all you don't "unlock" minibars. You open and close them. Second is he honestly suggesting that in this same scenario that if I took a box of Oreo's from my bag (that I had brought with me) and then swapped them with one in the min-bar that this would qualify as a transgression? What a freaking joke. ONLY the final disposition of the mini-bar matters, not how it comes by that disposition. It can of course be argued that the hotel is charging you for the oreo IN the bar. But I say they are charging you for the one they REPLACE it with. And there is no "fact of the matter" about it. Honestly the more I think about it, the harder I laugh. Open minibar, gaze longingly at oreo. Leave Oreo in minibar. Go down to local convenience store. Come back to hotel room. Eat oreo from convenience store. Open minibar, gaze longingly at oreo. Leave Oreo in minibar. Go down to local convenience store. Come back to hotel room. Switch oreo from minbar with oreo from convenience store. Eat oreo from hotel. And people get paid for this. "ONLY the final disposition of the mini-bar matters, not how it comes by that disposition." It seems to me it does matter how it winds up in its final state. Let's say you have the suitcase full of Oreos and just for fun you swap one of yours for the minibar Oreos. Then you eat the minibar Oreos. Must you pay? The question is whether you used the convenience they've offered. Really, you didn't. You had your own. You only swapped them to play a little game. You may as well have eaten the ones you brought with you. But if you don't have your own and you eat the ones in the minibar, because you're starving, you do use the convenience. If you go to the store when you're nice and full, and buy replacement Oreos, you've still used the convenience they offered. You have to pay up! It might help to pretend stocking minibars is backbreaking work. That might coax you into the intuition that it really does matter whether you took advantage of there being a minibar or you really didn't. That's not a matter simply of the minibar's final state. Hey...I think minibars used to be locked. Maybe that was in the old days. You go to a hotel room with a friend who is mischievious and knows that you have taken too many classes in moral realism. While you are sleeping he takes the oreo out of the minibar, puts in in a soft bag filled with another oreo cookie pack. He gently shakes it to make sure he's lost track of it. Then he puts one of them back in the minibar. There is a 50% chance that you are still in compliance with hotel policy. If you up the number of packs in the bag your percentage chance of being compliant diminishes proportionally. Wow! OK crosspost. My moral luck example stands. I don't buy it. The backbreaking bit doesn't help. It's immaterial as no one is stocking the thing if you replace it. If you don't leave the minibar in a state different from the one you found it in no one has to restock it. You are arguing of course that you're paying for the initial stocking, the one done prior to your arival. But that's ridiculous. What if 20 people went through that room prior to me? Which one of us was that stocking for? ALL of us? That's not a stocking fee, that's an ADVERTISING fee. It's not convenience. It's an ENTICEMENT. They put it in your room so that you will be TEMPTED. No. You pay for them restocking it. That's how they MEASURE whether or not you used the service. The presence or absence of the item in the minbar. Only if you trade in intuitions that float around in some Platonic realm where differences that make no difference make difference anyway are you going to get the intuition that there is something important going on here. I have zero intuitions that there is a problem here. I find it manifestly absurd. On final caveat. If there is a clear sense of contract where you agree not take anything out of the minibar I can see arguing a violation on the grounds that you have breached a contract that you agreed to. Something you sign when rent the room etc. But then it's a violation of your word. It's a violation of contract. It would be breaking of one's word not "stealing" or whatever this other thing is suppposed to be. When I replace the cookies, I'm compensating them for the cookies. I have no obligation to assure their outrageous profit margin. In fact, hotels take advantage of the fact that many travelers are foreigners or unfamiliar with the city that they are staying in and thus, unaware that 2 blocks away is a convenience store which offers the same product for half the price. Why should I do any favors to a business that is profiting from my ignorance? It would be different if the hotel were to advise me that there was a convenience story two blocks away. What if it were not Oreos, but Fig Newtons? I don't much like Oreos. The other thing to note is whether we are talking about this specific instance, or talking about this type of behaviour in general. It is clear from the way that this example has been specified that the overall consequences of cookie-replacement are pretty neutral. (They aren't completely neutral, since in one version the convenience store owner benefits a little, in another version the guest is out of pocket by $6 and the hotel is up by $4 or 5). But lets assume for the sake of argument that they are completely neutral in this one instance. I tend to think that we shouldn't adopt this general rule. It would clearly cause no overall harm if it were strictly adhered to. But in practice we might worry that people wouldn't always be completely reliable about ensuring that the Oreo they replaced had a more distant use-by date, or hadn't melted/been squashed in their pocket, or about remembering to actually replace it. That is why I think the guest 'shouldn't' replace the Oreo, but should instead pay for it if he/she has eaten it. The other thing to note is that the example only seems to work out if the hotel owner never knows about the Oreo replacement, or the supermarket owner never knows. Lets say that they would be offended if they knew that guests or shoppers were replacing goods without their knowledge. Does the fact that they don't actually know - completely neutralise the wrong of doing something that would offend/upset/disturb them? Yes--a trivial wrong. It's important to emphasize "trivial"! (1) If you replace the Oreos, you've effectively paid for the goods, but not for the service. You haven't compensated the hotel for supplying the minibar apparatus, paying a minibar stocker, etc. (2) How much must you pay the hotel for the service? Well, in our system, whatever they ask for. Sellers get to determine prices. Buyers can just not buy. If you make an exception here, why not make exceptions all over the place? Are you really going to decide what your dinner was worth before you pay the bill at a restaurant? (3) If everybody eats oreos and then replaces them, of course the hotel will remove the minibar, since they won't be making any money by providing it. Thus, replacing Oreos leads to the extinction of the service--which you wouldn't want. This is some indication that eating and replacing is the wrong thing to do. (4) Of course, if you're the only one who eats and replaces, and everyone else pays, then the minibar will stick around. But then you're a freeloader--not good. Jean: You say that in our system it's the seller who determines prices. That is generally true: I say "generally" because in some countries, one can bargain about the price. However, the fact that sellers determine the price does not mean that the system is right or ethical. One of the things at issue here is just that: whether it is ethically correct for a seller to charge an outrageous price and what should be the response of the consumer in the case of an outrageous price. Second point: you say that if everyone replaced the articles in the hotel room instead of paying for them, hotels would do away with the price of placing articles for sale in the rooms. There is another possibility: hotels would lower the prices of those articles and hence, their profit margin. Vox populi, vox dei. 71.5% of the people say that it is ethically acceptable to replace the cookies without paying for them; 28.5% that it is not. If you're going to make the argument that you don't have to pay because the price is too high, then you do have to consider whether you can underpay restaurant bills that are too high, shoplift at stores where the prices are too high, etc. "The price is too high" is rarely a good reason for taking goods without paying the price, so I can't see how it could be a good reason in this case. Re: poll. I wonder if the outcome would have been different if the questions had been phrased to make the options (1) Trivially wrong, OR (2) Permissible. I think people may be confusing triviality with permissibility. Jean: You're distorting my position and the position of the man who replaced the cookies. I never said that one is justified in taking the goods (shoplifting) when the price is too high (except in certain "life and death" situations which don't apply here). I said that one is justified in replacing the goods. "One of the things at issue here is just that: whether it is ethically correct for a seller to charge an outrageous price and what should be the response of the consumer in the case of an outrageous price." You're using the thought that the price is too high to justify replacing the Oreos instead of paying the price the seller is asking. I asked--is "the price is too high" a legitimate consideration? I argued: if it is, then that would seem to permit us to do all sorts of things, like underpaying restaurant bills or maybe even shoplifting. Or are you saying that "the price is too high" allows a person to leave replacements, and nothing else? But then, that would mean I can go down to the expensive restaurant shop and grab whatever goods I want, and then come back later with less costly replacements when that's convenient for me. Surely that's not permissible. I don't have a handy list of things justified by the fact that a price is too high. However, the fact that a price is too high does justify certain behaviors, for example, replacement in the hotel room, that a fair price does not justify. It does not justify stealing, in my opinion, except in life and death situations. Your example of eating something in an overpriced restaurant and then replacing it just isn't real, so I find it impossible to answer. Probably, the best response to high prices is to shop elsewhere and if that is impossible, to organize consumer movements (boycots, etc.) against those companies which overcharge, which all too often are monopolies (or which control huge market shares): cell-phone companies, giant retail chains, hotel chains, airlines, etc. I didn't talk about replacement in the restaurant bill case. I just said if "the price is too high" is a legitimate consideration, it will lead to justifications of all sorts of things. My example of taking things from the expensive hotel store and later replacing them is perfectly realistic. Why it would be OK to do this in the minibar case, but not in the case of the store? Why would it be stealing in the store case, but not in the minibar case? You originally talked about a restaurant, and I don't see how you can leave a restaurant without paying, simply because the owner will call the police. The same is true in an expensive store. It is impossible to take goods out of a store, without the owner calling the police. Furthermore, why would someone in the real-world run the risk of taking something out of a store and then almost immediately replacing it, when she could end up in jail? Since rash and stupid conduct is never justified (says Aristotle), I would say that taking something from a high-priced store without paying and then replacing it is not justified. Prudent conduct (says Aristotle) is justified and the oreo cookie man was prudent. It's been fun. I have to run. People leave restaurants without paying all the time. They also shoplift (without getting caught) all the time. In any event, the issues about getting caught don't seem to go to the heart of whether doing X is justifiable or not. I think there is an analogy between stealing music because the price is too high and the Oreo's too. People are focusing on simply the value of the object that they are purchasing, without considering all of the other things that they are paying for when they buy the service. When I buy a CD, I'm not just paying the musician and (the apparently more objectionable) music label, but I'm also paying for the clerk behind the counter that rings me up, the employee who annoyed me during my process of selection (I have to pay for that?! ), the fact that the store has a wide selection for me to choose from, etc. Similarly, I'm paying the hotel for the foresight that they had that I would want Oreo's in my room (or Fig Newtons). I'm paying for the person who freshens up not only my minibar, but EVERYONE'S minibar, even those rooms who are not in use, just like I pay for the bread that EVERYONE gets at the restaurant, even if some people don't want it and never eat it. When we think of it this way, we may get a bit miffed and say, charge me 20 cents less on my burger, and I'll forego the bread, but it doesn't work that way. The Zeno's arrow paradox of triviality? Is there a point at which something becomes so trivial you hit the target anyway? I don't distinguish on the basis of triviality myself. If it's wrong to do (by my lights), then it's not trivial (to me). Indeed, as Jean suggests, on one view an accumulation of these Oreo trivialities will mean the death of the minibar! The minibars used to be locked, but that's rare now. The hotels measure their convenience machines (minibars) in one of two ways: a) the staff does a basic inventory. b) the minbars have weight systems that detect when items are moved. One can see why they implemented b) as it removes human error, takes no time for staff to take inventory, and prevents the shennanigans being discussed here. It also creates the (rather funny) situation that you could take something out of the minibar and put it back and still get charged for it. How's THAT for convenience! Two comments on the preceeding: Dom points out that there is some potential difficulty in restoring the "final disposition" of the minibar. I agree with this. In fact it's my only qualm here, that restoring something to a state is difficult to do. This is what the weight based minibars solve: they have a weight disposition that is independant of the products inside. So you can take a product out, put it back, and you have STILL disturbed the disposition of the convenience dispenser. Second the reification of "convenience" is interesting. It is without question true that purchasing minibars, stocking them, maintaining them, and so forth, has a cost, and this is what you are paying for when you use the minibar. By "rules of the free market" they can charge you whatever they like for this convenience, and you have the option of using the service or not. But "free market" is tricky (because in fact true "free" markets have no rules whatsoever). I have no problem with a world where people go down to the convenience store after eating the oreo to get (in this ideal example) the EXACT same item to replace the original (molecule for molecule even!). Why? Because in this world nothing will change after the minibars disapear. Everyone was ALREADY going to the store. Objection: for some hotels the location of the convenience store will not be convenient. Answer: these hotels will still be able to front minibars. This is the wierd confusion I don't understand over the original example. There is effectively no difference between comming into the hotel room with an oreo already in your hand vs getting one after the minibar violation. It's not convenient to go and replace the dispositional state of the minibar. Would it change the intution pump if the guy took 8 hours to find the exact replacement candidate for the Oreo? This doesn't help sustain the cost of minbar maintenence but in a counterfactual world where people are willing to go to great lengths to get Oreos after eating them from the minibar the minibar actually serves no purpose. It is a convenience machine that plays no part of any mechanism. Of course all of this is moot if the dispositional state that is being charged for is "non-disturbance-of-minibar-weight-measurement-device." You're not being charged for the oreo. You're being charged for disturbing the equilibrium of the convenience machine. When I was a kid, I bought a video game at store X. A week later, I found out that store Y has the same game for $10 less. Alas, I had already opened the game and store X did not accept returns on opened video games. I went to store Y and bought the same game at store Y's price. Then I took the unopened game to store X and got a refund at store X's price using store X's receipt from a week ago. Thus pocketing a net $10. Is this the same ethical problem? I think it's not quite the same. It just involves part of the original problem--the part about deception. It doesn't bring up the same issues about goods vs. services. If you just replace the oreos, you never pay for the minibar service. If you return the replacement-video to store X, it doesn't seem as if there's any issue of not paying for services. There's a deception that's bad for store X (because they'd like to avoid returns), but it's not bad for quite the same reasons the minibar ruse is bad for the hotel. Example: my friend just bought a laptop. A couple days after he bought it, the price dropped $100 because they introduced a new laptop line. He requested that refund the price. They accept this. Why? Because by contract he can return it and buy it back for $100 cheaper. Not quite the same but whenever there are return policies it changes the lay of the land. There are of course no return policies on the Oreo's. I'm starting to think of all of this in terms of implict contracts. If there was an understanding for example that the fridge (and the energy it consumes) were supplied gratis, as part of the room infrastructure, and that the only thing you are expected to pay for is the replacement of the items by the stockers then no one can complain if you replace the items with their perfect equivalent. On the other hand, if you view the fridge as an automated convenience store that has been placed in your room and opperates on a completely self contained business model then I think things do get trickier. At least part of this is due to that we are suspicious of returning food items. You can't willy nilly return stuff to the grocery store for example, and for obvious reasons: the quality control is a crucial part of our expectations about food and who KNOWS what people have done with that food after it leaves the store. If food were something that could be exchanged like laptops or games or whatever, I think the whole thing would probably collapse (there would be little difference of opinion on the subject). We relate differently to food than to other kinds of goods. If the minibar sold durable goods then...well. That would be a failed business model. We don't have durable good vending machines. "Removal of items constitutes purchase. There is no return policy on these items." Then I accept that it is wrong to replace the items with anything else. In fact it is wrong to take the items out and put them back. We have such a radically different vision of how a contemporary capitalist economy functions that I find it difficult to discuss this issue. You see the primary goal of the economy as providing services; I see the primary goal as making a profit, the highest possible profit, and maximizing stock prices. You see the economy as not only legitimate but also morally justified; I see it as basically amoral, often immoral and legitimate only insofar as the laws are made in benefit of capitalism. I don't justify shop-lifting or leaving a restaurant without paying, because the fact that supermarkets are horrid profit-making machines is not a justification for me to become a thief. However, the oreo man seems to have tried to invent a creative solution to the fact that he was being over-charged and that makes him to something of a moral hero for me. The fact that he wrote to the New York Times about what he did and that he blogs about it indicates that he is an ethically sensitive fellow who wants to open a debate about how we behave in a world where we are often the impotent victims of huge corporations which manipulate us for their profit. For that reason, he seems to me to be the complete opposite in ethical terms of a shop-lifter, who is a selfish person, thinking only of him or herself, although no more selfish than the supermarket chain where I am forced to shop, simply because they drove all the independent food stores out of business. Agh, where did all that come from? I've made no general claims about the economy, etc. etc. You said the exorbitant cost of the oreos was reason enough to "take and replace." I was merely trying to examine that belief. If that's right, then it also ought to be true that we can "take and replace" in the costly hotel store. But we can't. So the exorbitant cost isn't adequate justification. My diagnosis of what's going on in both the minibar and the store case is that there's an illusion that replacing the oreos is the same thing as paying. The reason it's an illusion is because there's more to pay for than the oreos. There's also the service involved in putting them there (i.e. in the minibar or in the store). If you make use of the service, but don't pay for it, that's stealing...which is wrong (except maybe in very unusual circumstances that don't apply in this case). As to how much I must pay for the service--well, sellers get to determine that. If it's too much, I can always just not buy. I never agreed that it is ethically wrong to take and replace in the costly hotel store. I simply said that the person who did it was going to end up in jail, and thus, it is not wise to do it. And while I agreed with you that in contemporary society, sellers determine the price: I never agreed that that is an ethically correct situation. Quite the contrary, I've argued that contemporary economies are amoral or immoral (no, I'm not talking about the nice old used book seller who sold me an edition of Balzac, printed in 1901, in hardcover and with illustrations from his dusty little book-store this afternoon.) The problem is that attempts to change or even reform capitalism have failed. How do I, as a ethical person, live with that fact? By always following the rules as determined by big business or by trying to look for creative new fair solutions, as did the oreo man? The latter path, I think. WHAT IF IT WERE FIG NEWTONS? I think that all of this stuff exists as background assuptions. Incidently this is where I think metaethics inveitably rears it's ugly head. As you note in the following paragraph it has to do with what constitutes "adequate justification." I for one think exorbitant costs can be adequate justification. Or rather, that there are thresholds where one is justified in refusing to play the game. Wayne suggested one above with the gas station. Your response was that this brings in need vs luxury. My response is that all of this is just a question of what people will assent to, and what values a particular community justifies. So, it is redundant, but I feel compelled to note: when I note above what I would accept in terms of it "being wrong" I'm only working out what I would assent to, which presupposes a whole set of background assuptions. I can see other people making different choices and being FULLY "justified," according to a different set of assumptions. Corporations are giant machines. I have no allegiance to them. Yet they have many of the legal rights that human beings have, and more of those rights are on the way (much to my horror). Then of course they are owned by people, who benefit enormously from the operation of the machines, and they employ a great many people. So it's very difficult for me to figure out how to relate to the whole system. I categorically reject that corporations should have the legal rights of human beings, but I'm constant forced to relate to them as human beings at the legal level. This leaves me ambivalent. All of this is my round about way of saying I'm pretty sympathetic to elements of the position Amos suggests. I guess I'll find out when I read your book, but do you ever take on the fact that the factory in "factory farming" is almost certainly a direct outgrowth of capitalism and commodification in general? Or is that issue left to the side as it were? I don't see why you say what's justifiable is just a personal matter. I don't think anybody who's paid for the room can use the exorbitant cost of the oreos as a reason to "take and replace." It fails the "making sense" test. That's not to say that exorbitant cost couldn't be a relevant consideration when it comes to other moral questions, involving other settings and agents (price gouging at gas stations during a storm, etc). I just don't see how it comes into play here. Re: the "factory" in factory farming. No, not too much about capitalism, commodification, etc., in my book. I don't think ethical justification is a personal matter. I think it's a sociological matter. One is always justifying one's behavior to other people. I think ethical commitment is a personal matter. So you decide what kind of ethics you are commited to and you justify that ethics to various communitites. Personally I think I can accept that when you get the room you are assenting to a whole constelation of things. Yes it's just a "rationalization." But that's what I think all ethics is: rationalizations. The giving of reasons which are or are not accepted by various communities. The arguments of the radical vegan contingent don't "make sense" to you either. I think that for lack of new terminology, we are forced to see non-human relationships, those with big business in human terms. Let's take another example: I am traveling through the Bolivian countryside, no town in sight, but I lodge for the night in the cottage of a peasant, who charges me 10 dollars for a room and breakfast. In the morning I find that he has placed a bottle of water beside my bed (there is no clean drinking water there), for which he charges me 5 dollars extra, twice the market price. I also know that he walked 2 kilometers to the nearest store to buy the water. Do I pay him the 5 dollars or do I jump on my mountain bike and speed to the nearest store to buy water for half the price and replace the expensive water that the peasant has bought for me? For me, any decent person will pay the peasant the 5 dollars: there is really a service rendered, there is a human relationship. However, with the hotel there is no human relationship, yet we are forced to talk of it in human terms, in terms of services, in terms of reciprocity, etc. It's a kind of alienation of language, in my opinion, which tricks us into becoming obedient tools of a monstruous system. Faust, Stretches of reasoning really can be deficient in logic, fact, etc...whether some community finds them appealing or not. Surely that's the way it seems to people when they are actually engaged in the back and forth of debate. Some points sink, others swim. I worry that someone armed with your metaethics would have an excuse to dig in their heals and just "accept or not accept"...for no real reason. Amos, I like the example and the way it shows that sometimes there's a palpable sense that service must be compensated. I agree that's missing in the Oreo situation, but still, noticing the goods/services distinction is helpful because it dispels an illusion that we experience when we first start thinking about the problem. At first we think "oreos replaced with oreos, what's the problem?" In fact, the situation is more complex than that. I completely agree that there is this sense that if you accept my metaethics that it creates justification for relativity among communities. But I don't think it changes anything. Pro-life Christians have already dug in their heels on abortion, no matter what arguments you present. They've dug in their heels, in part because of their particular brand of moral realism (God is real and he wants X and that value trancends time and space etc etc). I think it's pretty clear that what makes people dig in their heels are their commitments to various presuppositions. In fact their commitments are so intense....that they often want to ascribe to those presupositions an "objective" status. In my view that's the motivation for trying to ground ethics in ultimate reasons in the first place. Everyone wants the sense that their moral intuitions are hooking up with the fabric of the universe. Now would we all experience coversion to the same point of view if we knew all the same nonmoral facts? etc etc. In my view EVEN IF moral realism is true, at the pragmatic level you will NEVER escape people making commitments and justifying themseleves to a community. The ONLY difference is that some communities will claim that their reasons are grounded in the structure of reality and supported by the facticity of the world (whether we are talking about DCT or Kantianism). Anyway, I won't drag you down this path again (else I fear I will become a type 4 commenter), it's just that (oddly?) it's precisely in relatively trivial cases like this that my sense of the what I experience as the wierdness of moral realism hits me the hardest. I will say that I think this example is actually considerably more interesting than I first thought, which is fun. I'm STILL having trouble with the idea of paying for "convenience." I find this idea utterly repulsive, and I'm trying to figure out why. Ha--you'll never be a "type 4 commenter." I'm actually thinking of subjecting a class to The Oreo Problem (an instant classic). I like the way nobody starts off with much of an opinion about it, but all kinds of moral reasoning emerge as you think about it. It's pleasantly trivial too... and I've always liked Oreos.